In my last post, I promised to show you why you should NOT EAT noddle alone and how best you can prepare it. Let’s get to it in a bit. Something in December 2016, we were at the verge of rounding up 30 days live practical we started with rats for our degree project. I was working on a different topic with Garlic while a colleague of mine was working on White Magic (Monosodium Glutamate (MSG) popularly know as AJI-NOMOTO). We were the two that took up a rat study under our supervisors. So it’s was obvious we both understood our different project. During these times, I have come to understand that the primary main ingredient used in the preparation of the spice used for cooking noodle (aside from the wheat flour used as the primary main ingredients for the whole) is this Monosodium Glutamate my colleagues were working on. So while I invested time in my own research, I invested my time in hers too. I even had to do her statically analysis for Free because I wanted to be sure people won’t manipulate values for us. Now! Here is the thing. We feed about 28 rats, but they were grouped into four. 👉👉The second group was administered only their normal feed and Monosodium glutamate (MSG). With these different groups, We were meant to do a histological lesion (carcass analysis) on both the liver and the kidney. (Just forgive my big grammar) and also on the kidney and liver functions. At the end of the 30 days, we dissected the rats, took the blood samples and also the kidney and liver of all rats of each group. Here is what happened that shocked me. When we compared the control group with the rats that were feed with ONLY MSG, there was a significant INCREASE in the weight of the rat and the liver weight. Not only that, the different SENSITIVE MARKERS for both the kidney and liver (e.g Serum Alanine Aminotransferase (ALT)) increased significantly. We went further to view the lesion on the tissues of both the liver and kidney, and it was ridiculous. The same ingredient we eat on a daily basis in the name of eating noodles! Going further to see what happened when Vit C and E was used as a protective agent to counter this effect. It was noticed that Both Vitamins significantly countered the oxidative stress induced by MSG. I was shocked to my bone marrow. I came to understand why tummy-tummy noodles had to incorporate a little bit of vegetable as their ingredient (this is not in any way endorsing Tummy Tummy Noodles). Maybe Because, if we look further, a Nutritionist-Dietitian was involved in their recipe development. 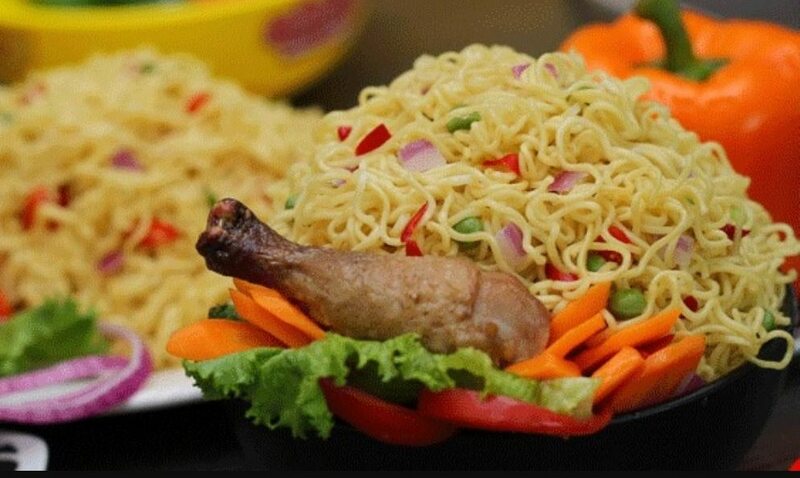 No doubts Noodles is one of the food that you can literally cook within a few minutes. That is exactly why a good population indulge in eating it (which am not an exception, lol). The fact remains that we can’t keep substituting health with convenience, which is why we must find an alternative around it. Now, here is the alternative. A lot of folks reading this are mostly entrepreneur which most times predisposes us to tight schedules and little attention to our eating habit, But for the sole purpose of still being health, Here is how best to prepare those noddles. 👉👉But very high in Carbohydrate. From the story Injected here, you can notice that the combination of vitamin C and E became a protective agent. You must make sure you have, tomatoes, green beans/pumpkin leaf, garlic/onion and crayfish at your disposal. The fact that you use crayfish shouldn’t make you leave out egg if you love egg too much. But hey! Never try frying egg together with your noodle. If must us use egg, make sure you boil it. Do you have questions? Ask in the comment section. Chikaodi Linda Your Peer-Published Nutritionist and A DigiHealth evangelist.